Image courtesy of the Library of Congress In 1921, a portrait monument to suffragists Susan B. Anthony, Elizabeth Cady Stanton, and Lucretia Mott was unveiled in the U.S. Capitol. 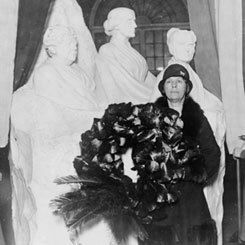 This 1929 image features a member of the National Council of the Woman’s Party honoring Susan B. Anthony’s birthday. On this date, suffragist Susan B. Anthony’s petition to the 43rd Congress (1873–1875) regarding a fine she received for illegal voting was referred to the House Judiciary Committee. Following the Civil War, Anthony—a lifelong advocate for women’s rights—and other suffragists sought to convince Congress to strike gender-specific language in the 14th Amendment, and prevent passage of the 15th Amendment (which extended equal rights and suffrage to African-American men only). Meeting little success, they adopted a “new departure” strategy which interpreted the 14th Amendment as granting all naturalized and native born Americans citizenship, believing that particular status inherently conferred suffrage rights. Anthony was among several women who voted in Rochester, New York, in the November 5, 1872, election. On November 28, she was arrested on the charge of “knowingly and unlawfully” voting. Anthony used her criminal trial as a platform for her views on women’s suffrage, refusing to pay the $100 fine levied upon her conviction in order to gain greater publicity for her cause. After a higher court refused to hear her case, Anthony turned her attention to the legislative branch. She sent a petition and a copy of her trial transcript, imploring the House and Senate to waive her fine. Arguing that she voted “in common with hundreds of other American citizens, her neighbors,” Anthony declared “it is a mockery to call [my] trial a trial by jury.” The House Judiciary Committee failed to act on the petition, though Anthony never paid her fine nor served jail time. Fourteen years after Anthony’s death, the states ratified the 19th Amendment, granting women the right to vote on August 18, 1920.